Do You Want To Become "Certified Uloggers"? Kindly Fill Up This Form. If You Are Already A "Certified Ulogger", There Is A Separate Form For You. Hi uloggers globally, we are now gradually working towards growing "the number of certified uloggers globally". This will constitute a gradual process but our goal is that "everyone" becomes a "certified ulogger". Hi uloggers globally, this is a quick note to welcome you. We want to create one giant "true family" on the internet, one that moves together regardless of circumstances. One where "human" holds sway, bulls or bears. 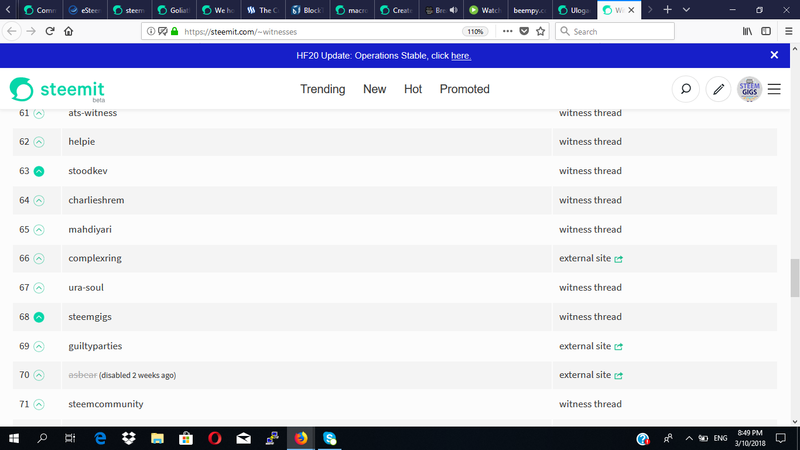 We have thought to build one simple innovation on the steem blockchain that is "surpassing google" by filling the search engines with "humans" (the awesomest version of human), one that brings the steem blockchain to indispensable main-streamity, one that takes cognizance of "everyone". All these things are possible! Thus starting now, we are focus on emanating "certified uloggers" globally. Simply put, "a certified ulogger is a true celebrity". Ulogs.org and the entire #ulog ecosystem is to be built around "certified uloggers" (true celebrities). Our success isn't measured in bulls or bears, it is measured in "humans" i.e the number of great men and brothers we can emanate. Simply put, "the number of certified uloggers we can bear forth". Everyone can become a "certified ulogger". Blockchain itself and in this case the steem blockchain, will not find its true beauty, till we grow as humans. We will display that this is the case as we begin to shine our light, shaking the steem blockchain with our beauty. This is one movement. This is one real movement filled with humans. We will move together and as one. We will be "true fans" of one another, each of us "true celebrities". To stick together thus, we want an exclusive hangout centre for certified uloggers, a true home for certified uloggers online. At this point, i kindly implore you to read some of these posts, to gain insight into how crucial the role of "certified uloggers" is in the ulogs.org ecosystem. Our primary aim is to grow in the number of "certified uloggers". This will be an ongoing gradual process. While some are selected proactively as "certified uloggers", please be proactive about becoming "certified uloggers". This is essential as there are more than 7 billion globally and over time, we won't be effectively able to reach everyone. Our growing list of "certified uloggers" is on https://ulogs.org/discover and this list will be gradually updated over-time. Thus, if you see "the real" in the #ulog movement and managed to be touched, fill the form below to join the ranks of "certified uloggers" globally. Over the course of time, there will be many perks for certified uloggers on ulogs.org, with ulogs.org, your ultimate "true fan" and we as one big solid family. After you have filled the form below, we will gradually send out emails, containing details of exclusive chat-channels for certified uloggers e.g Discord, Telegram, Facebook etc, where we will hangout as a family and stir real world adjustment together and we will go from there. You can invite anyone to fill this form as well but kindly stir them into reading some of the posts about the #ulog movement, before they proceed with filling the form. We want each "certified ulogger" to truly love ulogs.org as "true fans" and owners. Go straight to filling the form here!!! A Little Bit About The Perks Of Being "Certified Uloggers". As said above, "Certified Uloggers" is the back-bone of ulogs.org. Our entire ecosystem is built around them. As mentioned earlier, ulogs.org is "an ultimate true fan" of every "certified ulogger". To effect this, we will update the website dynamically, in ways to bring "certified uloggers" constantly to the fore. "Certified uloggers" will also be part of our eventual game app. Currently, only "Certified Uloggers" can appear or feature on UloggersTV. Note also that Ulogs.org will be integrating every existing hashtag, community, projects etc on steem allowing users to be "true fans" of all these entities in fresh ways (per day), while in the art of ulogging. Now each of these ulog-subtags will have "certified uloggers" as overseers e.g see https://ulogs.org/created/ulog-snookmademedoit and you will notice a list containing two "certified uloggers" who oversee that ulog-subtag and corresponding ulog-community. 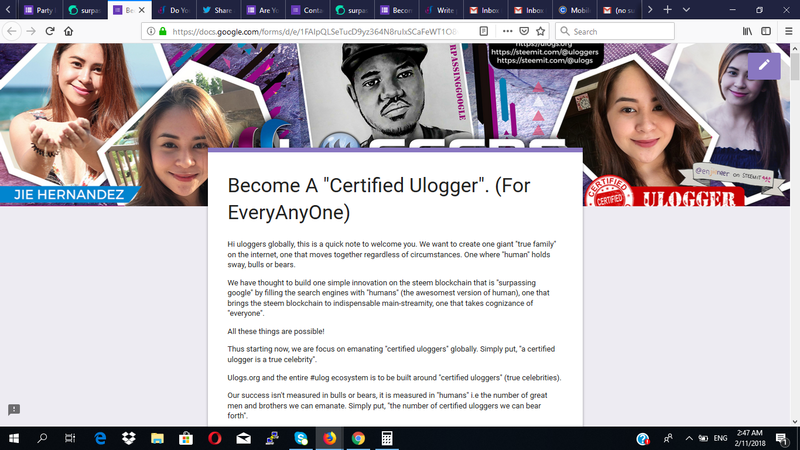 "Certified uloggers" will not only be overseers of these communities but will be empowered with tools and even extra influence (SP courtesy of ulogs.org to grow these communities) etc to autonomously grow these communities as "true fans" and owners. Ultimately, we will always seek ways to cater to "certified uloggers" in whatever we do. Overall, it will be an interesting journey and eventually, we will celebrate "breakthrough in human" together, with "an emblem of human", the @teardrops SMT, which will reward "proof of tears", for en-route "the awesomest version of human", there will be many tears, happy, sad or un-fell. One more thing, "certified uloggers" will have an exclusive chat-room upon which we can gather, upon which "humanity is the brother next to you". Are You Ready To Become A "Certified Ulogger"? Go straight to filling the form here!!! Please Look At This Ulogacy Video. In this video, a "certified ulogger" in the person of @bloghound contributes a "ulogacy video" to UloggersTV. In the video she answered a list of "optional questions" that we posed to her. She is pretty much a "private figure", so she decided to pixelate her video. Please Read This First, If You Chose To Submit A Ulogacy Video. Whether you a "private figure" or a "public figure" you can submit a "Ulogacy Video" to UloggersTV (YouTube channel). While this is optional, it is so encouraged. If you are "private figure" and you choose to submit a video, you can do so in a podcast-format where you exempt your face or you can use applications that can mask your face etc. In general, we want to know "you". We will vouch for and recommend "certified uloggers", when "opportunities" arise and it is key that we get to know what you constitute. Note that only "certified uloggers" appear on UloggersTV. So, once we accept your video contribution and upload it to "UloggersTV", you are a "certified ulogger". Again submitting a video to UloggersTV is optional and will not deter you from becoming a "certified Ulogger". It just an extra fun way of getting "certified". If you would like to try another method, simply skip this part and go to the next segment below. A major part of ulogs.org is UloggersTV. It is one way that we will use to stir growth for steem and the ulogs.org ecosystem as we will use it to showcase ulogging activities from "certified uloggers" globally, creating very shareable and promote-able ulogging media. We will also grow UloggersTV with ulogging activities, creating world-renown "trends" and these videos will also form the basis for our eventual ulogs.org game-app. We have a list of questions, which you can answer within your Ulogacy video. All questions are "optional". Simply pick any that you're comfortable with answering and kindly answer them within your video. Do well to recite or overlay on the screen, the questions you have picked as you begin to answer them. To start your video, indicate that your are a "certified ulogger" and how we can find you e.g "you can find me on ulogs.org/@yourusername". Remember with ulogs.org "flaws are allowed", so relegate your reservations. 2. How do you feel about yourself now? Is there an old-self, you would like to regain? Is there a new-self you would love to attain? 3. Mention one virtue, you wish you could work on. 4. What do you write about the most while #ulogging? 5. How did you find ulogs.org? 6. If you were to have a business, enterprise or company etc, what would you call it and what would it be about? 7. If you are able to create a hashtag around #ulog, what would you chose? 8. Do you believe you can fly? 9. If you had just one shot at "breakthrough" and it was your "very next Ulog", what would you write about? 10. Would you still read a mind, if you knew that this mind has loads of problems, that you aren't able to fix? 1. Do you like the #ulog movement? Do you love Ulogging? Why? 2. Will you consider telling others to try out #ulogging on ulogs.org? 3. Pronounce "Ulog" in one syllable just like you would vlog or blog. 4. If the word "Ulog" found its way into the dictionary, how will you want it defined? 5. Do you think "true celebrity-hood for everyone once and for all" is possible? 6. Do you think true celebrities can be true fans too? Note: All the questions were optional. If You Aren't Able To Submit A Ulogacy Video? You simply need to pick up any of the questions enlisted earlier (the video questions) and answer them using a ulog. Kindly visit this editor on https://ulogs.org/main-editor, create your ulogacy post by answering any of the said "optional questions" and when you are done, submit the URL to the form here!!! The above posts will give you some insight into our "growth plan". The eventual post to explain our growth plan (in full details) isn't completed yet but it will be in a few weeks and we want to start preparing now. While we may try to implement a "subscription model" in the long run, "perhaps involving 1 SBD", we prefer to experiment first with a hybrid of "donations/subscription" first. We will explain this better in our "growth plan" post. Basically, where the monthly subscription/donation by "certified uloggers" is 1 SBD, we intend to create ways of replenishing part or all of this amount over the course of the month, either using votes or perks. However the case is, we will be inventive in the methods we apply to this effect, with the aim of helping our "certified uloggers" further "mine the human". Ultimately, we want our "certified uloggers" to truly love what #ulog represent, as they apply its use to "truly grow", to where money becomes the "smaller things". We also want to create value for the "certified ulogger" role and this is another reason why we are embarking on this "donation/subscription" experiment. There are several other reasons for our "donation/subscription" experiment but we will discuss this further in our "growth plan" post. For starters, we will like to call this a donation as we will hold on to it for a start and we will intimate each "certified ulogger" as to when we will start the "monthly affair". Whenever this is the case, we will apply 1 SBD from your donation today, towards your subscription. We want to attain a certain "tangible number of certified uloggers" before we go on to the "monthly plan" and this experiment will help organize the model right. In any case, when we decide to receive a monthly subscription/donation, you can be sure that it will be around 1 SBD and we will relish ways to replenish it (per certified ulogger), over the course of the month. Note that you can also donate on behalf of others but for now, let's start with you. Go on to continue filling the form here!!! If You Are Already A "Certified Ulogger"? Click on this form; https://goo.gl/forms/G1GmCp83lcmM5xeZ2 and kindly fill it with your best contact information, so that we can have it as well as send you URL(s) for exclusive chat-room for "certified uloggers".